doTERRA’s grounding blend, appropriately named doTERRA Balance, promotes tranquility while bringing harmony to the mind and body, and balance to the emotions. 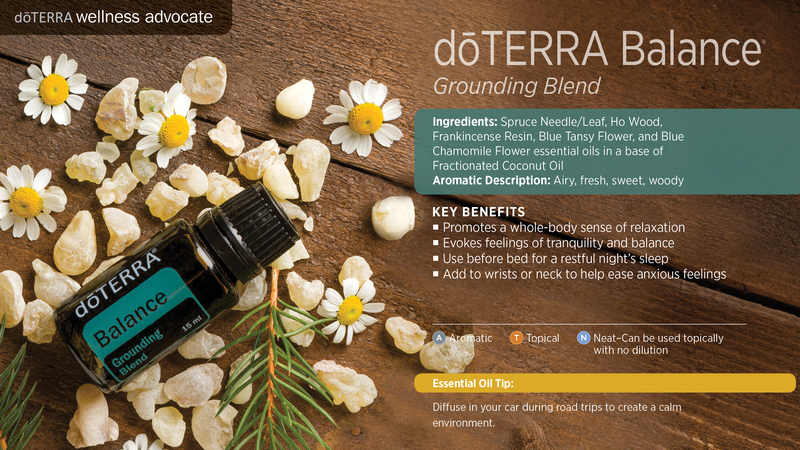 The warm, woody aroma of dōTERRA Balance Grounding Blend creates a sense of calm and well-being. We perfectly blend Spruce, Ho Wood, Frankincense, Blue Tansy, and Blue Chamomile with Fractionated Coconut Oil to offer an enticing fragrance that promotes tranquility and relaxation. Spruce, one of the oils in dōTERRA Balance, was used by Native Americans for health and spiritual reasons and is still used today to bring harmony to the mind and body. Ho Wood, Blue Tansy, and Blue Chamomile can ease anxious feelings, while Frankincense provides a grounding, balancing effect on emotions. Begin your day by putting Balance on the bottom of your feet to promote feelings of calmness and tranquility throughout the day. Balance is a great oil blend to use during an AromaTouch® Hand Massage. Apply to your wrists or neck to help ease anxious feelings. Diffuse in your car during road trips to create a calming, soothing environment. Spruce Leaf, Ho Wood Leaf, Frankincense Resin, Blue Tansy Flower, Blue Chamomile Flower, and Osmanthus Flower essential oils in a base of Fractionated Coconut Oil.